The Daily Post Creative Writing Challenge: 2AM Photo, can be found here. Here’s my contribution (fiction, but the pic is mine). It’s 2 AM Christmas Day, and this is what his father sends me. As if I don’t feel guilty enough. I couldn’t help it. I had to go. How many times have I said those words? Now it’s Christmas and he’s awake and looking. I don’t need the picture. I already felt awful without it. This is his father’s way of showing me what I’m missing– what he’s there for and I’m not. I’m not angry with his father though. He’s not wrong. But still. It’s Christmas. Can he give me a break? I didn’t need to see this picture. Not at 2AM on Christmas Day. Gosh, he does look cute though. I love his little pajamas. Why does he look so tall? His shirt barely fits him anymore! He’s growing up before my eyes. He’s growing up in a series of pictures sent to me on my iPhone. I wish I could see his face to read the expression. Is he excited? Scared? Anxious? What’s he doing up at 2AM anyway? Is he sick? When did he get so tall? 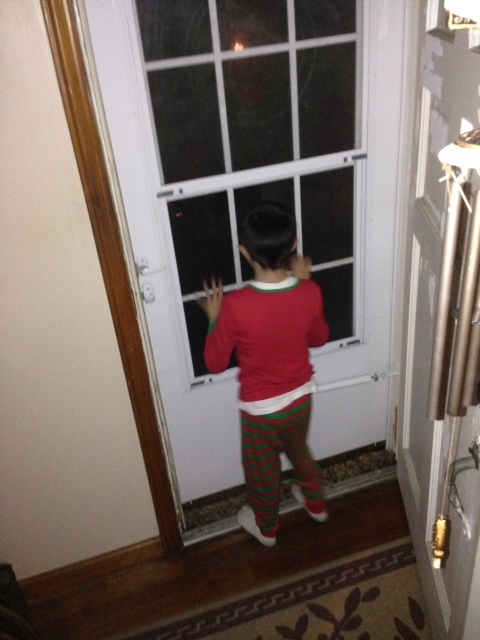 Is he looking for me or Santa? Most likely Santa. He doesn’t look for me anymore. He used to wait at the door for me to get home from work, but now he knows not to expect me to be walking up the front path. Luckily, he loves his father who’s also his mother. What have I become? My role in his life is diminished to that of an occasional visitor. I had to go. I had to leave him. It’s our livelihood. I couldn’t help it. I had to go. It’s not my fault Christmas falls at the end of the month, at the end of the year. It’s not my fault I got stuck here. I was supposed to be home by now. I hope his father explained that I can’t control the weather. I hope his father told him that I love him. On second thought, I won’t put the phone down. It’s 2AM and he’s awake. I think I’ll call him and tell him that I love him, and tell him to go to sleep so Santa can come. That’s what I will do, instead of crying. I love the picture. I’m so glad he sent it. Aww thanks! I appreciate that. Hope you are well in Moscow. I am so glad this is fiction b/c it made me so sad! Aww thanks! I will email you on my return. In CT with husband.